Did you know that the secret to a great smile is not just teeth? Your gums are also important! Almost every day, I encounter patients complaining of gum bleeding and they want to know the reason. Sometimes, they relate bleeding to brushing or flossing hard, however, a healthy gum should not bleed. Inflammation of the gums can happen in the presence of bacterial biofilm, which is also called plaque. Usually the area that the bacteria accumulate in is called a “pocket.” When plaque is left on teeth surfaces, it can harden using the minerals in saliva and form calculus or tartar. Tartar looks like a yellow or brown rock which cannot be removed by brushing alone. Gum inflammation in the early stage can cause gingivitis, and, if left untreated, can lead to periodontitis, where the bone surrounding the teeth is also involved. The plaque inside pockets produces a toxin that leads to bone loss. If you loose bone around your teeth, the gums will recede and destroy your smile line. Ultimately, bone resorption can lead to teeth mobility and teeth loss. Although your dentist can clean the tartar using a scaler or ultrasonic instruments, it is very important to floss. The plaque between your teeth can only be removed by flossing and, if you don’t floss, you miss more than 30% of the plaque. Also, periodontitis and bone resorption usually start in-between the teeth, another reason why flossing is very crucial. There are different stages of treatment for gum disease. 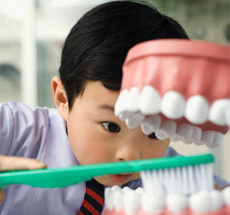 If it’s in an early stage of gingivitis, a “regular cleaning” may be enough. However, patients with periodontitis may need a “deep cleaning” or more advanced surgical procedures such as gum surgery and bone grafting. Your oral hygiene and regular visits to your dentist can help maintain your gum health. If you are looking for a dentist who keeps you health the primary focus, please call my office for a free consultation: (818) 600-8667.